One of my favorite kids science experiments is the “Rubber Chicken Bone.” It teaches and demonstrates the importance of calcium to the bone structure. Though the message is important, the actual experiment is actually quite fun and simple. It requires a week to fully complete. As kids science experiments go, this one is relatively inexpensive. 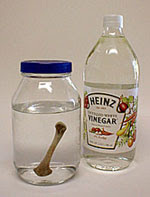 All you need is three drum sticks, two jars, and some vinegar. You want to take a picture of your child trying to bend all three bones as much as he or she can. Grab them at each of their ends and bend downward; you will see it will be extremely difficult. The photos will show no bending. Then take the two jars and put one in each; filling them with vinegar as to completely cover them. Leave one in for three days; the second inside for seven days. At the end of the third day, take one out and again try to bend it. You will realize it is bendable and squishy. The other should be removed after the seventh day. See how bendable this one is. Notice how it has completely lost all its sturdiness. Of all the kids science experiments I have done with my kid, this one is my favorite. We often tell our children how important it is to drink milk and get other forms of calcium into their system, but this actually demonstrates to them what we mean. Have fun with it and don’t forget to capture the data in notes and pictures as you go along. Also, make a nice display so it can stand out along side all the other science fair experiments. Please drop me an email me if you have any questions. Now, boil and egg and set it aside allowing it to cool. When its room temperature, peel the shell off. Place the bottle on a table making sure there is nothing around it that may be flammable. Now have a responsible adult light three matches and place them inside the bottle all at the same time, not one at a time. Quickly, place the egg on top of the bottle opening. The matches will heat up the air, which causes the air to expand. When the matches go out, it causes the air inside to contract as it cools down. Lower pressure is created inside the bottle, than can be found on the outside. 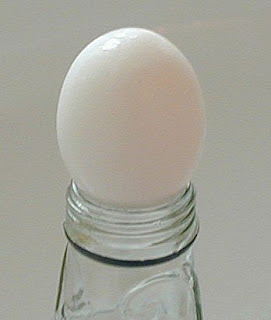 The pressure outside of the bottle causes the egg to get sucked into the bottle. Pretty who science fair project huh? What happens is that heat causes most solids and liquids to expand. Cooling whatever it is causes them to contract. The Atoms or molecules the solids are made up of vibrate more quickly with the higher heat. This causes the solid/liquid to become larger, and when it is cooled, it become smaller. I hope you enjoy all the kids science experiments I have on my site. When you were a kid, how did you research kids science experiments?